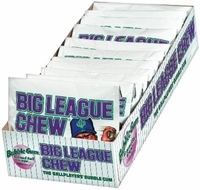 Big League Chew Ground Ball Grape Gum. Get your game going with a big juicy hunk of this stuff. This is one ground ball you don't want stopped, the flavor just keeps rolling along. Great for the 7th inning stretch. Long lasting, super grape taste. Make sure you get in front of this one. You don't want it getting past you.